Is Concentrated Stock Holding a Bad Idea? The fact that you’re no longer employed by that company makes it significantly less risky because now it’s just your portfolio rather than both your portfolio and your job being tied to that company. That said, having a significant part of your portfolio in any individual stock can still be dangerous, depending on circumstances. The key question: How problematic would it be if the stock collapses? 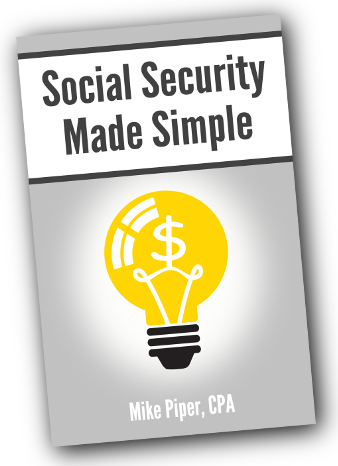 If your Social Security (and other non-portfolio income, if applicable) covers all of your needs, then it’s a very different situation than if a large portion of your living expenses must be covered by your portfolio and this stock makes up a large part of your portfolio. Are there any shares for which the capital gain isn’t very large (e.g. because they were bought toward the end of your career and the stock hasn’t done much since then, or because they were purchased with automatic dividend reinvestment)? If there are shares for which the cost of selling would be minimal (either because the gain is small or the tax rate is very low), it’s very likely a good idea to go ahead and sell those shares in order to diversify. For shares for which the cost of selling would be significant, the key question is how likely it is that your heirs will be inheriting the shares (and receiving a step-up in cost basis). The more likely it is that the shares will be left to heirs (rather than liquidated and spent during your lifetime), the more sense it likely makes to hold on to them. Why Not File and Suspend? First, let’s answer the question the reader did not actually ask. If you reach your full retirement age on or after 4/30/2016 (and are thus subject to the new rules regarding voluntary suspension) filing and immediately suspending will make no sense. For people subject to the new rules, suspension will only make sense as a way to essentially change your mind (i.e., you filed early, then later wish you had waited). You are not planning on using the “restricted application” strategy yourself (i.e., you are not planning on collecting spousal benefits between your FRA and your age 70 while allowing your own retirement benefit to continue growing). Doing so would give you the option to retroactively unsuspend later, at any point prior to age 70. This can be particularly helpful in the event that you suddenly learn that your life expectancy is shorter than you had initially thought. Example: Barbara is unmarried. She files and suspends immediately at her FRA of 66. Then at age 68, she is diagnosed with a medical condition that indicates a dramatically reduced life expectancy. She chooses to retroactively unsuspend, going back to her FRA. As a result, she gets a lump-sum check for 24 months of benefits, and her monthly benefit going forward would be what it would have been if she had simply filed (and not suspended) at age 66. To reiterate what was said above, if you’re married, there is one case in which you would definitely not want to file and suspend, even if you could do so before 4/30/16. Specifically, you should not file and suspend if you plan to use the restricted application strategy in order to receive spousal benefits between your FRA and your age 70 while allowing your own retirement benefit to continue growing. In such a case, filing and suspending will have either of two distinctly detrimental effects. First, if your own primary insurance amount (PIA) is greater than 50% of your spouse’s PIA, filing and suspending would mean that you are no longer eligible for a spousal benefit at all. This is because of CFR 404.330(d), which states that if you are “entitled” to a retirement benefit and your PIA is greater than or equal to 50% of your spouse’s PIA, you are not eligible for a spousal benefit. And once you file for your retirement benefit, you become “entitled” to it, even if you suspend it. Second, if your PIA is less than 50% of your spouse’s PIA, filing and suspending will still result in a smaller total monthly benefit than if you had not filed and suspended. Example: Your PIA is $800. Your spouse’s PIA is $1,800. If you file a restricted application at your full retirement age, you’ll get a spousal benefit of $900 (i.e., 50% of your spouse’s PIA). If you instead file at your FRA for both retirement benefits and spousal benefits you will receive your retirement benefit of $800 and a spousal benefit of $100 (calculated as 50% of your spouse’s PIA, minus your PIA). But if you ask to have your retirement benefit suspended (i.e., you “file and suspend”) you’ll be left with just the $100 spousal benefit per month until you eventually unsuspend. Are Inverse ETFs a Good Way to Reduce Risk? For most individual investors inverse ETFs are not an ideal method for reducing risk. Frankly, I would encourage most individual investors to stay away from inverse funds, especially leveraged ones. For those unfamiliar with the concept: An inverse ETF seeks to do exactly the opposite of whatever the index in question does on a given day. For example, ProShares Short S&P500 seeks to provide -1x the S&P 500’s daily return. So if the S&P 500 goes down by 1% in a given day, this ETF should go up by 1%. There are also leveraged inverse ETFs that seek to provide a multiple of the opposite of the index’s daily return. For example, ProShares Ultrashort S&P500 seeks to provide -2x the return of the S&P 500 each day. The problem with inverse ETFs isn’t that they fail to do their job. In most cases, they do a good job of delivering the targeted return each day. The problem is that, over an extended period of time, the math doesn’t work out the way that most people would intuitively expect. Over the period in question, the regular S&P 500 index fund lost approximately 20% of its value. Many people would therefore expect the inverse ETF to have increased in value by about 20%. But it didn’t. It only increased in value by about 1.2%. And the leveraged inverse ETF didn’t go up in value by 40%. In fact, it didn’t go up in value at all. It decreased in value — by every bit as much as the regular S&P 500 fund! Why Do Inverse ETFs Work This Way? The reason that inverse ETFs provide -1x the index’s return on a day-to-day time frame, yet something very different from -1x the index’s return over a longer time frame is simply math. Let’s look at a simple two-day example. Imagine that a given index goes down by 3% on one day, then up by 1% the following day. Over this two-day period, the index will have provided a total return of -2.03% (because 1 x 0.97 x 1.01 = 0.9797, which is 1 minus 0.0203). If you want to make a bet that a particular index is going to decline in value on a particular day, inverse ETFs are a good tool for that purpose. But very few investors should be betting their financial future on such short-term fluctuations. For most people, if you want to reduce the degree to which you are exposed to stock market risk, the best solution is the simplest one: reduce the percentage of your portfolio that is allocated to stocks.